للمسافرين الذين يرغبون أن يعيشوا كل ما تقدمه المدينة، Rose Garden Motel هو الخيار الأمثل. يمكن من هنا للضيوف الاستمتاع بسهولة الوصول إلى كل ما تقدمه هذه المدينة النابضة بالحياة. يضفي محيط الفندق اللطيف وقربه من أكثر المعالم السياحية جذبًا سحرًا خاصًا على هذا الفندق. إن الخدمات التي يقدمها Rose Garden Motel تضمن للنزلاء إقامة مريحة. يقدم الفندق فرصة للاستمتاع بشريحة واسعة من الخدمات بما فيها: واي فاي مجاني في جميع الغرف, تخزين الأمتعة, واي فاي في المناطق العامة, صف السيارات, غرفة عائلية . بالإضافة لهذا، تتضمن كل غرف الضيوف مجموعة واسعة من وسائل الراحة . بعض الغرف توفر حتى تلفزيون بشاشة مسطحة, سجاد, قهوة فورية مجانية, شاي مجاني, صوفا لإرضاء أكثر الضيوف تطلبًا. سواء كنت من محبي الرياضة أو كنت تتطلع لتفريغ عناء نهار صعب، ستجد خدمات ذات مستوى عالي بانتظارك كمثل حمام سباحة خارجي, مسبح (للأطفال). اكتشف مزيجاً ساحراً من الخدمة الاحترافية والخيارات الواسعة من وسائل الراحة والمتعة في Rose Garden Motel. The lady at the reception was very nice and gave us some useful info. The room was absolutely quiet and generous in size. 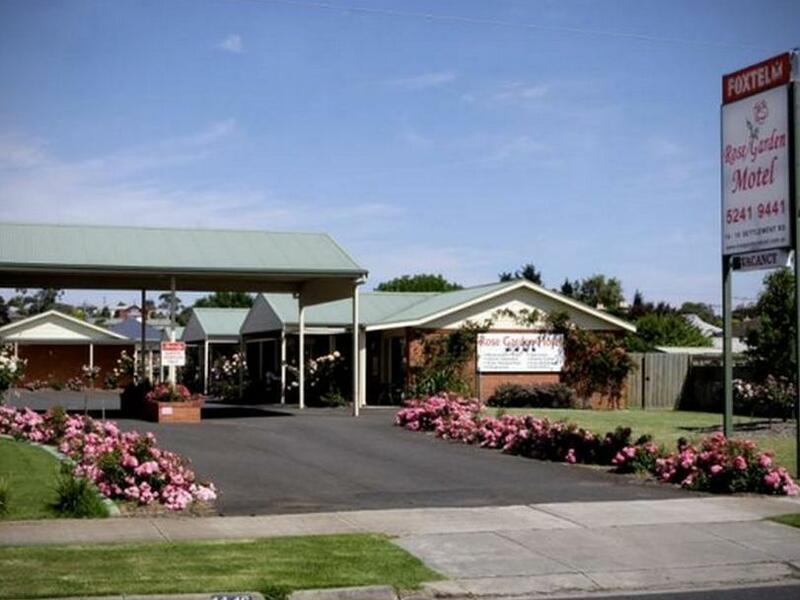 Perfect motel for people looking for a stopover around Geelong. Of course you will need a car to stay here, but Geelong sights and the Bellarine are within a short driving distance. I recommend! A very friendly welcome, a lovely quiet & clean room, a most enjoyable stay! Not an extravagant 5 star motel but good value for money! Quite the nicest lady on the desk was just the start of a lovely overnight stay & she gives nice clear directions to the pub for tea and to the airport next morning. Have stayed in countless motels and really loved Rose Garden. Thank you so much. A very good motel. Great value for money, very clean with excellent amenities. The room was spacious and well equipped with some thoughtful features not normally experienced. The owners were very helpful and friendly. We would highly recommend this accommodation. More than happy with everything. Very happy with our stay. We will definately stay here again. The room was clean and well appointed. The bed was comfy & the surprise was the fruit and yoghurt we were given complimentary with our breakfast was lovely. Stayed here while we visited the beaches and had little day trips. Motel was very clean and amazingly quiet, slept well every night. Hosts are very friendly and accomodating, will definetly stay here again. Great. We spent a night there before heading to barwon head for sky dive. It is only 15 minutes drive to barwon head. The room is clean and comfortable. A good stay. Plenty of space to park, nice outdoor space, good quality as new interior. Very clean and well serviced. Some noise between rooms. Positioned on service road. Highway noise quietens down about 10pm. Modern facilities: family unit has two tvs, free wifi,free paytv & free dvd available. Bathroom has large shower and good quality toiletries. The staff was friendly, the room is a pretty old but clean. There's a backyard where you can chill out. about half hour drive from Avalon airport, we stayed for the night and kept on driving to the great ocean road. the owner was very kind and friendly, giving dinning tips and directions. the room was very clean and well equipped, direct access to garden and pool. overall very satisfied.